I heard about 'Mask of Magnaminty' from Lush a while back now and after reading a number of good reviews I decided that I wanted to try it. Unfortunately I would get so carried away buying the bath ballistics I would completely forget about it when I went into the shop (oops.) Eventually I did pick it up just over a month ago and I am so glad I did. The mask has a strong peppermint smell, at first I found this to be a little overwhelming but I soon got used to it. My favourite thing about this mask is that it contains anti-bacterial properties meaning it can help to prevent breakouts. This mask can be used on the face or even on the back when those pesky spots arise. The mask applies to the skin easily and I have found that I don't need to use a lot of product to get an even coverage. When applied the mask feels very cooling (which may sound strange but it feels lovely on the skin). I have found it is best to leave the mask on for around 10-15 minutes to ensure that is completely dry on my skin. When it comes to removing the mask it doubles up as a gentle exfoliator and leaves my skin feeling lovely and soft. I have been using this mask as a part of my skincare routine twice a week and since I have been using it I don't seem to have had as many breakouts which is good news for me. 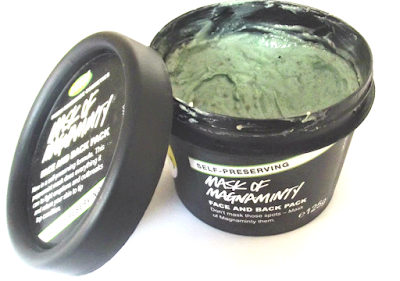 I purchased the 125g self preserving version of this mask for £5.25 from my local LUSH store, but it is available online too (link). I've never tried anything by Lush. Looks great. Check my blog.